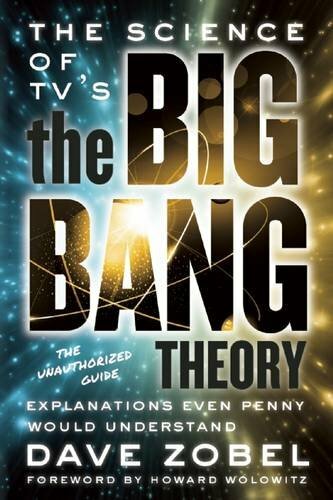 Contests > The Big Bang Theory fans – book contest! We have an advance copy of The Science of TV’s The Big Bang Theory by Dave Zoebel to give away to a fan of the incredibly popular series. If you love Sheldon (Jim Parsons) and his pals, you’ll want this book, which reveals the hard facts behind TV’s most popular sitcom. It demystifies Howard, Leonard and Raj’s scientific wisecracks for the Pennys of the world. Zobel lets all of us in on the punchline by breaking down the show’s scientific conversations. From an explanation of why Sheldon would think 73 is the best number, to an experiment involving the physical stature of Wolowitz women, to an argument refuting Sheldon’s assertion that engineers are the Oompa-Loompas of science, the book equips us to feel worthy of a seat on Sheldon’s couch. If you’d like to win a copy of this book, which isn’t available for purchase until June, tell us below in the comments which episode is your favorite, or tell us your favorite Sheldon quote. The contest ends Friday, May 8 and we will notify the winner by email, so please include an email where you can be reached (it will remain private). We will announce the winner’s name on this page and in our moviemail newsletter. Our winner is Ena Draken of Kingston. Congratulations and thanks to all who entered – please make sure to enter our other contests for a chance to win! I love the Big Bang Theory, and this would be an amazing addition to my bookshelf. There are so many favorites. …If I had to pick it would be the Christmas episode where penny gives Sheldon the napkin signed by Leonard Nemoy! I have seen every single episode but by far my favorite is when Sheldon and Kripke compete to have a better office. Then, at the end Sheldon doesn’t like the office and yells at the birds that they are out of tune! Guaranteed the best episode. Winning this book will definitely add to my small collection of Big Bang Memorabilia. I just love when Sheldon says “BAZINGA”. He says it in such a deadpan way that I laugh every time. Best episode is when Penny injures her shoulder in the shower – Sheldon drives ! Favorite is the episode where they discuss changing Back to the Future and the have has hasn’t happened conversation . We love watching the Big Bang Theory. My favorite episode was when Sheldon was drunk and was making crank phone calls to the Scientist. This would be an awesome read! I have to go for some surgery this summer and will be home for 4 to 6 weeks recooperating and this will certainly lift my spirits!!! The one where Penny got Sheldon the autograph from Leonard Nimoy. Sheldon’s reaction was perfection. My favorite Sheldon quote is: I am not crazy, my mother had me tested. Oh so hard to pick a favourite!!! I love the one where Leonard gets a call from the security guard aboyt Sheldon and he has to go chasing him through the ball it! My favourite quote from Sheldon is: Howard, you know me to be a very smart man. Don’t you think that if I were wrong, I’d know it? My favorite episode is when Sheldon plays fun with words with Stephen Hawking. I love the episode where Sheldon plays Words With Friends with Stephen Hawking. “My Mum had me tested” never ceases to crack my up everytime, I think that’s one of the Sheldons best quotes. When penny gives Sheldon the leonard nimoy (may he rest in peace) signed napkin with his dna! Too funny!! I have been watching the show since the 1st day it aired….there are too many episodes and they are all my favourite…I guess if I had to pick one where Leonard had to pick one person to go to Switzerland and chose Penny over Sheldon and in the end Raj went on his own since Sheldon passed a cold/flu virus by sneezing to Penny who gave it to Leonard….and when Sheldon laughs quietly to himself……. I love the episode where Sheldon makes fun of geology and then ends up reading the textbook while drunk. My favorite episode is Leonard purposes to Penny,and Penny says YES! Sheldon: THIS IS MY SPOT! The dressed up Halloween episodes are always the best. When Sheldon tried to teach Penny physics. My husband and I love Big Bang Theory. My favorite shows are when Sheldon kissed Amy and when Leonard and Penny became engaged. We love all of their shows. We feel like they are a part of our family! I have 2 favorite episodes: The xmas one where Penny gets Sheldon Leonard Nimoy’s autograph, and the other xmas one when Penny gets Leonard’s mom drunk. I adore the episode with the ball pit! The love the episode when Sheldon gave Amy a tiara to make up for being a bad boyfriend. He never expected her to kiss him! I love the episode when Penny gave Sheldon the used napkin from The Cheesecake Factory. I think it was used by Leonard Nemoy? Sheldon hugging Penny in the end was so awesome! Sheldon: If your bathroom floor counts as a carry-on, you’re packed. The Middle Earth Paradigm- where the boys went to Penny’s Halloween party and were totally awkward. As a life long Trekker, I got my nephew addicted to TBBT. The book would be for him. My favorite episode was when all the friends enjoy the last dinner made by Mrs wolowitz. And the scene was was when Benedette takes Sheldon and Leonard to talk privately and Howard ask the rest of the gang if his wife sounds like his mother. And everyone casualty replies nooooo……. My favourite episode of all time is when Sheldon gets honoured and has to speak publicly. He is so nervous he gets drunk. Jim Parsons then deserves every award for the scene in which he sings the periodic table of elements. It’s hilarious! Hard to pick just one quote. Sheldon is so funny. Here is three. Feelings? What am I? A hippy at a love-in? Says to Raj – Interesting. You’re afraid of insects and women. Ladybugs must render you catatonic. Rock Paper Sissors – Scissors cuts paper, paper covers rock, rock crushes lizard, lizard poisons Spock, Spock smashes scissors, scissors decapitates lizard, lizard eats paper, paper disproves Spock, Spock vaporizes rock, and as it always has, rock crushes scissors. My favorite Sheldon thing is the Soft Kitty song. Find myself singing it at the weirdest times. Amy and Sheldon’s first meeting ‘date’! Any episode where Bob Newhart, the lads idol, appears. My 11 year old son is a fanatic of them, he has the rubber action figure, most of Sheldon’s t shirt and some of the group. Hi. Thanks for the contest. My favorite quite is Bazinga! “I can grow my own Leonard Nimoy.” Such a great show. This show has been my favorite comedy since it began…….so very, very funny! Never miss an episode. My favourite is The Fortification Implementation. Because I actually was at the taping of it. Was cool to see how it was done. EPIC!! I love Sheldon. He’s my favourite. Best episode recently is when Sheldon and Amy build the fort with sheets. I used to build so many of them as a kid and was always as excited as Sheldon. The Adhesive Duck Deficiency! Leonard, Raj and Howard go on a camping trip to watch a meteor shower. They are given some pot cookies by some women camping nearby. They spend the rest of the time stoned, telling each other their deepest secrets and a bunch of nonsensical stuff, while desperately searching for food. They are about to raid the boy scouts camp and they find an “I love you brisket’ in Howard’s pack from his mother! In the same episode, while the boys are camping, Penny falls in the shower and Sheldon has to dress her and take her to the hospital, when they get back to her apartment Penny asks Sheldon to sing soft kitty to her! Hilarious!!! My favorite is when he first meets Amy and they ‘establish parameters’ what a romantic?! This would be an awesome book! I was hooked from the very first episode…and I grew up with 3 Pennys (my sisters) in my life!!! I would love to let them read it…after I have read it myself!!! There are so many good episodes to chose from that it is very difficult to select just one. I think the most memorable is the one where Howard and Raj find a date (Amy) for Sheldon. I love the show and I love when penny gives Sheldon the napkin signed by and with which leonard nimoy wiped his mouth and Sheldon says– I possess the DNA of leonard nimoy! I absolutely love the Big Bang Theory. My favourite episode was when Howard was in space and both his Mother and Bernadette were yelling at him. I thought it was quite funny how he wanted to be called Rocket Man and the rest of the Astronauts kept calling him Froot Loops. I love The Big Bang Series. I have seen every episode. Sheldon: Interesting. You’re afraid of insects and women. Ladybugs must render you catatonic. Love The Jiminy Conjecture episode. The Lizard-Spock Expansion is my favorite episode. Sheldon said this “Scissors cuts paper, paper covers rock, rock crushes lizard, lizard poisons Spock, Spock smashes scissors, scissors decapitates lizard, lizard eats paper, paper disproves Spock, Spock vaporizes rock, and as it always has, rock crushes scissors”. The Egg Salad Equivalency is one of the best episodes, in which Sheldon displays his utter lack of social skills. In response to Alex’s sexual advances, he tells her “my father used to say that a woman is like an egg salad sandwich on a warm Texas day. Full of eggs, and only appealing for a short time”. Later, when trying to explain himself to Mrs. Davis in HR (an African-American), he states “All women are slaves to their biological urges. Even you. You’re a slave.” Finally, he throws his friends under the bus, by revealing personal secrets about them to the HR staffer. So wrong, on so many levels, but hilarious just the same. My favorite episode is when Sheldon and Raj face-off against Wil Wheaton and Stuart in a card game. I love when Sheldon says revenge is a dish best served cold in Klingon. I just love when Sheldon says “BAZINGA”. They are all great episodes. But the one that stands out for me is when Penny gives Sheldon the napkin. That was awesome! Penny: Maybe I could do it? Sheldon: You, really? You can assess the quality of my work? Okay, um, here. I wrote this when I was five years old. Penny: A proof that algebraic topology can never have a non self-contradictory set of abelion groups… I’m just a blonde monkey to you, aren’t I? Sheldon: You said it, not me. LOL Sheldon’s BAZINGA quote is always a classic! My favourite ( my kids absolutely think it’s a hoot ! ) is the one where Sheldon goes a little off the edge and ends up in the ball pit of a pizza place trying to work out his string theory. When Leonard goes to get him and he starts to hide , that was comedy gold. Whenever my kids see him pop up and say ” Bazinga ! ” , they just bust a gut laughing. The episode where Sheldon and Amy meet for the first time on a blind date, especially the last 5 minutes of the episode, has got to be some of the funniest moments in the series. My favourite episode is the one where the Spock figure is talking to Sheldon – classic! A close second is the one where they reveal how the elevator was broken (destroyed). Any episode with Bob Newhart. How can u ask us to choose one specific one when they are all so hilariously funny! However, if I had to choose one, wow, that’s tough. I find the series has added spark and spice with the addition of Amy and Bernadette. My husband loves the one where Sheldon is at Amy’s place and the monkey is chain smoking. Everyone loves the Xmas one with the Leanord Nimoy signature on the napkin. It’s a classic. Especially when Howard and Raj walk into Sheldon and Leonard’ apartment loaded down with the various size gift baskets while Sheldon calmly walks in looking at his phone. My favourite is when Sheldon whispers in a deep voice..”I’m Batman”. But they all make me laugh! They all do an incredible job! My favorite episode is when Penny gives Sheldon for Christmas Leonard Nimoy’s autograph on a napkin & he hugged her & gave her all of the gift baskets. my favorite episode alex ask leonard on dinner date. And penny gets jealous. and Sheldon explains to alex about sexual transmitted dieases. The one last night with both Sheldon and Leonard’s moms together was ridiculous! A very funny series, and my fave episode was “The Comic Book Store Regeneration”. Thank you. My daughter and I love watching this show. It’s a weekly ‘date’ on Thursday nights. Our favourite episode is the ‘Bath Item Gift Hypothesis’. At the end, Sheldon gives Penny all the gift baskets after receiving a napkin containing ‘Spock’s DNA’ and said “I know! It’s not enough”. Hilarious! If I had to pick one episode it might be the one were Sheldon has his Warcraft account hacked, and they go to confront the thief but its Penny that saves the day. I love all the episodes so much and have seen them all multiple times! Love episode where a sick Penny forces Sheldon to sing “Soft Kitty” in rounds with her! I absolutely love The Big Bang Theory. Every episode is my favourite – you can tell by my laughter. My favourite Sheldonism is his knocking on Penny’s door. Penny, Penny, Penny. One of my favourite episodes is when Leonard buys a time machine thinking it’s a small scale replica and it ends up being the full size prop used in the movie The Time Machine! My favourite quote was when Amy asked for 1 green tea bag and 1 peppermint tea bag in her cup when Sheldon asked what kind of tea she wanted. Sheldon replied, “Oh my Lord woman. Mixing tea bags – this isn’t a rave.” He cracks me up!!! I watch big bang every night , no matter how many times i saw the same show its still good to watch. My favorite quote is “I’m Batman”. This is my husband’s favorite show and never misses it. He loves when one of our television stations does a weekend marathon of The Big Bang Theory he watches everyone he can. My husband would love this book and it would make a great 30th Anniversary gift. The best episode is the Christmas one when Sheldon receives Leonard Nimoy’s napkin from Penny. There are a lot of insanely funny episodes of this show! I also enjoyed the scavenger hunt episode where Howard and Amy are paired up and end up singing Neil Diamond songs instead of participating in the hunt! My favourite episode is the one that James Earl Jones takes Sheldon out for a wild night on the town. Simple Plan’s Chuck Comeau dishes on FIFA Fan Experience launch, new music & more!